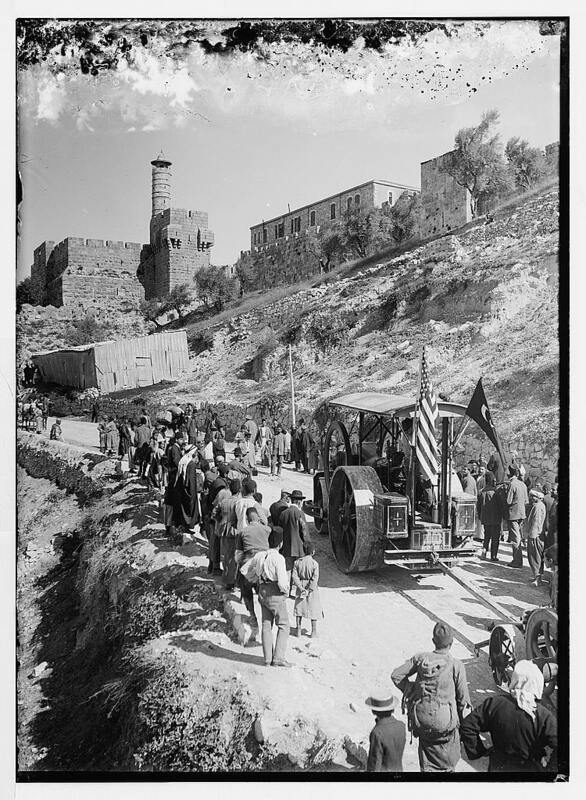 Picture a Day - The Holy Land Revealed: Another Mystery Photo -- A Steamroller in Jerusalem Can You Suggest Why It Flies an American Flag? Can You Suggest Why It Flies an American Flag? The Library of Congress provides little information about this dynamic picture in Jerusalem. The picture's caption reads "Steamroller on Jerusalem Street." The date of the picture is given as sometime between 1898 and 1946, nearly 50 years the American Colony photographers were active. The steamroller is on the left side of the picture surrounded by a crowd. Why is it flying an American flag (alongside what appears to be a Turkish flag)? As we researched, we discovered another photograph of the same vehicle. The second picture was taken outside of the Jaffa Gate, beneath David's Citadel. The first picture was taken on Mamilla Street with the vehicle heading away from the photographer. The photographer's back is to Jaffa Gate. 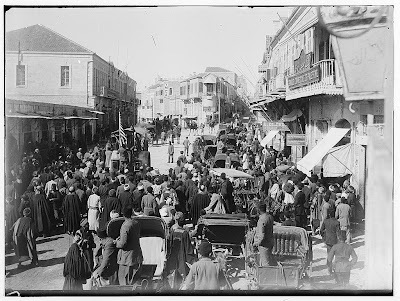 The picture was taken during the Turkish rule of Palestine, sometime in the early1900s and before automobiles were introduced. Only horse-drawn wagons are on the road. Perhaps the steamroller was a vehicle never seen before by Jerusalem's residents, and that would explain why all traffic stopped. Perhaps the American flag was being flown because the vehicle was an American gift or produced by an American company. What's your opinion? Send us your comments, please. Click on the picture to enlarge. Click on the caption to see the original photograph. Subscribe to Israel Daily Picture by entering your email in the box in the right sidebar. It's free. New comments: Hat Tip to Reader Paul M! Read his comments below which explain the American flag and help date the picture. The first picture shows a building marked as a YMCA in the center distance and, in the right foreground, what appears to be a Banque Commerciale de Palestine. Several web sources (e.g. Table 3 here: http://bit.ly/MIrLXb) state that that bank was founded in 1911. The Y was relocated from the Jaffa gate to its more famous location opposite the King David hotel in 1933. So the photo dates to that period — 1911 to 1933 — and more likely to the shorter interval of 1911–1917 since, as you point out, there are no motor vehicles in the picture. 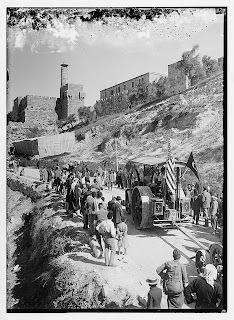 gave them outright charge of various projects.… They helped bring the first steamroller to Jerusalem for upgrading the city‘s roads—the machine, not surprisingly, came from Chicago!" I don't know what Powers' source for this is, but if it's accurate it explains the flag. aw, I was going to suggest counting the stars on the flag but I see someone found a reference much more reliable.